The holiday season started early for me today when I was presented with a fabulous homemade advent calendar lovingly designed and constructed by my 12 year old daughter. 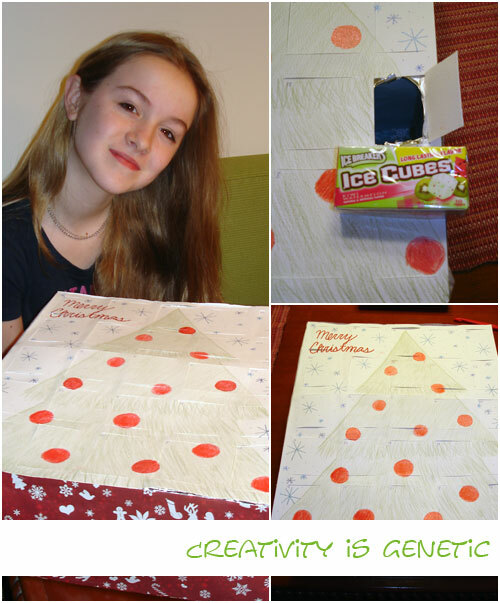 Creativity is without doubt a genetic trait! She has no interest in web design and wants to be an architect. She has inherited her creativity from me but is a spitting image of her Dad . She will be highly annoyed that I have featured her on my blog but here she is with her wonderful gift. Today’s treasure was a packet of ice cubes, I’ll keep you posted on what’s behind each door. This entry was posted in Chicago Web Designer, Random Thoughts. Bookmark the permalink.